My first post of 2018 and surprise surprise it’s a cake! I just needed something more glamorous bright and beautiful to start the new year, and of course delicious too! 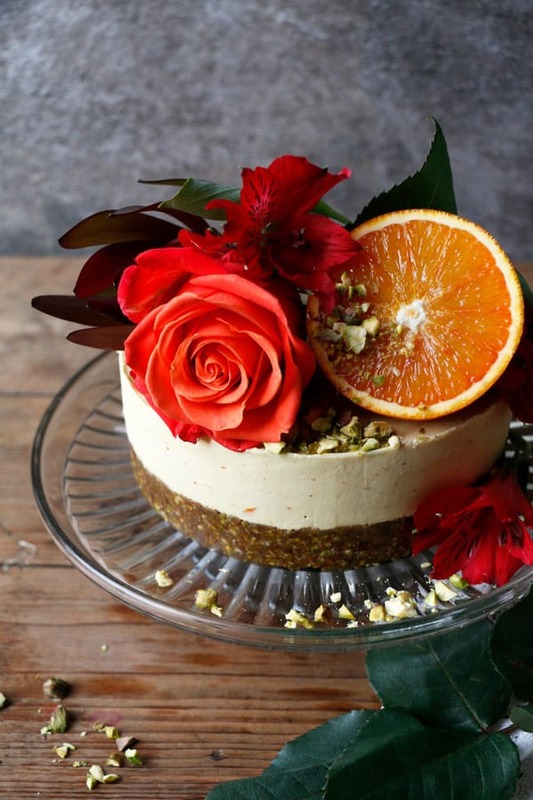 So here we go one Pistachio Blood Orange Cheesecake to kick off the new year in style for your pleasure. 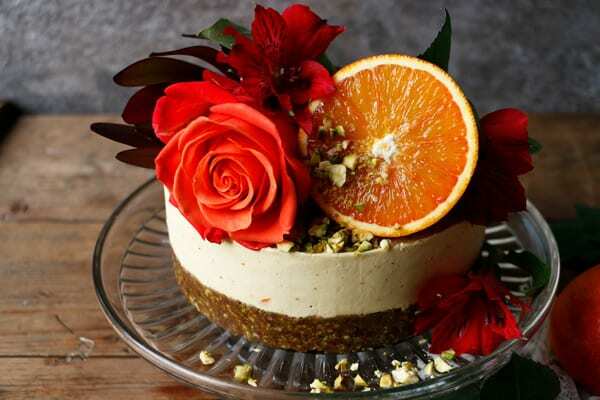 The recipe is a classic cashew cheesecake with the wonderful addition of seasonal blood oranges. 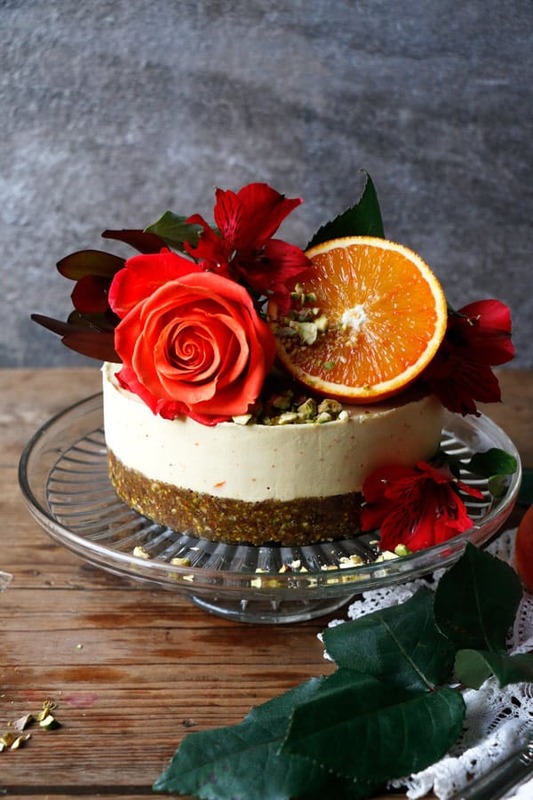 Although my blood oranges weren’t as deep red as I would have loved to, they tasted absolutely divine and made this cheesecake really special. I suppose it might be still too early in season for those deep red ones. I’ve picked mix of pistachios and almonds for the crust layer, you could use either on their own if you like. The top creamy layer is a mix of cashews, plenty of blood orange juice and zest, coconut butter and maple syrup. Depending on the size of your oranges you will need two to three for the juice and one to two for the zest. Feel free to adjust the zest to your taste. 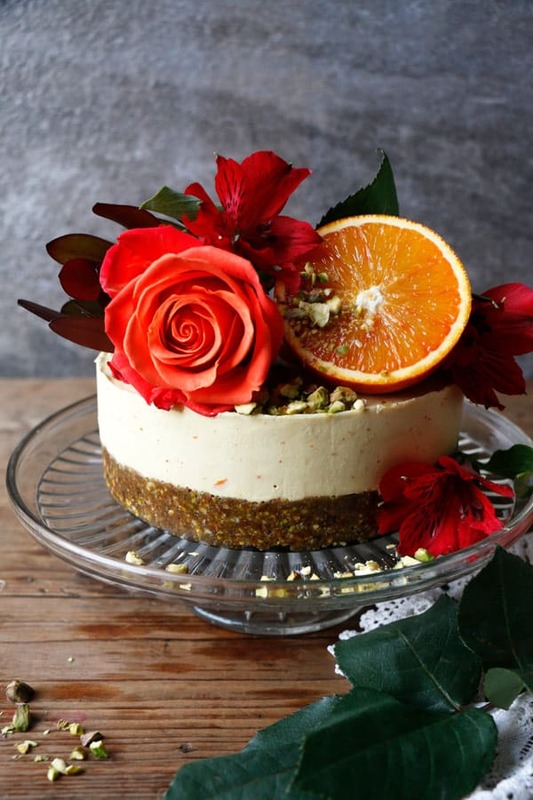 You can get really creative with the toppings or just leave it plain, I’ve used sliced orange, crushed pistachios and fresh flowers. Wishing you an incredible 2018 filled with Love, Light & Magic! Prepare 6" round cake tin with removable base. Place shelled pistachios and almonds into a food processor or high speed blender and pulse few times until coarsely ground. Add pitted dates, cinnamon and salt and blend until the mixture comes together. Spoon the mix into the tin, spread evenly onto the base and press tightly down. Place into a fridge. Rinse the soaked cashews under running water and place into blender. Add orange juice, zest, maple syrup and vanilla and blend until smooth. I've used about 180ml (3/4 cup) plus 2tbsp orange juice. Slowly add melted coconut butter and blend until incorporated. Make sure the mixture is at room temperature before adding the coconut butter. Place into a freezer overnight or for at least few hours to set. Once set carefully remove from the tin. 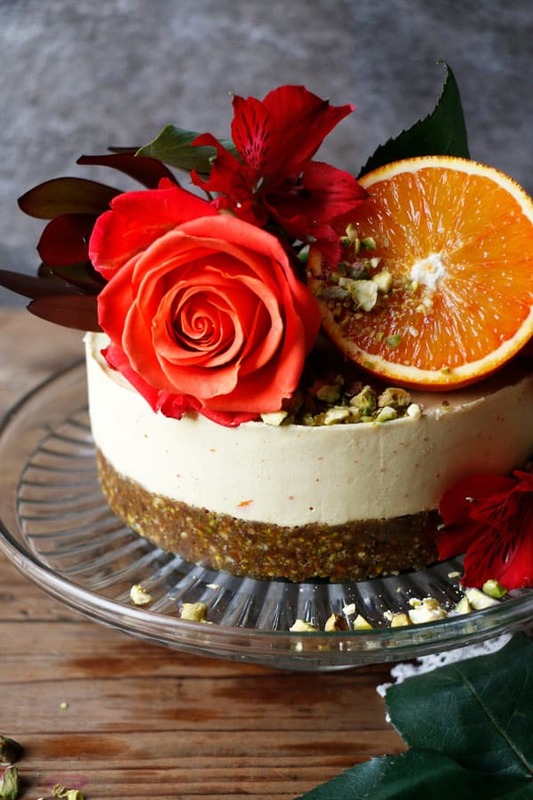 Place onto a cake stand and decorate with sliced blood orange, crushed pistachios, fresh flowers or toppings of your choice. 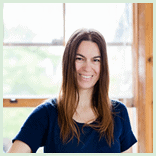 The blood orange layer colour will depend on your blood oranges, deeper red oranges should turn the top layer pink. My soul speaking & healing. Much Love to you. 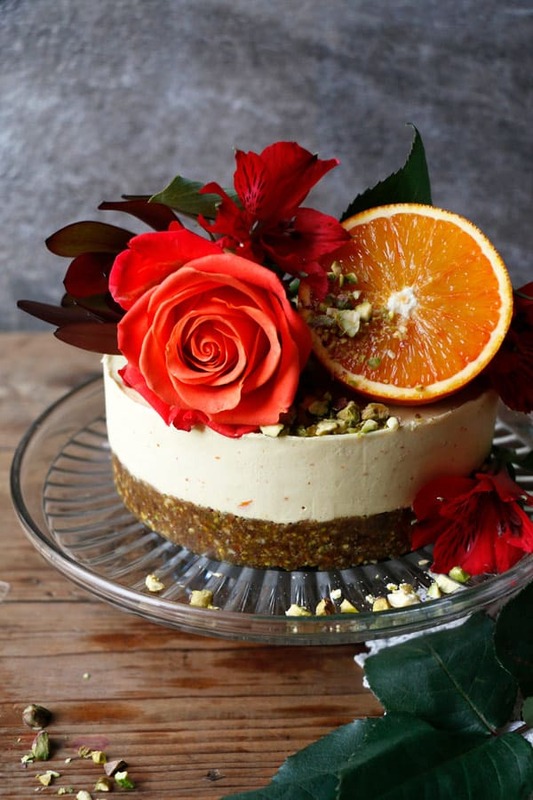 This cake looks beautiful Hana, and I adore anything with blood orange! Can’t wait to get my hands on some. Thanks for this recipe! I just made it, to bring to a potluck tomorrow night. I added a bit of lemon juice to the blood orange filling, just to tart it up a little. Can’t wait to taste it tomorrow! Hello! This looks and sounds divine! I want to make it for Christmas but I don’t have a 6″ springform pan, can a 8″ or 9″ work and it just will be thinner? Why do they call it cheesecake if there’s no cheesecake? Or am I missing something? Hi Maria, it’s a vegan style cheesecake. The mix of cashews and lemon juice (in this recipe orange juice) will create a cheese-like taste. You can go further and ferment it too. Also, the texture is one of chilled cheesecake.